This news item was posted in K, Knee category and has 1 Comment so far. Osteoarthritis in the knee, resulting from wear and tear on its parts. Inflammatory knee problems can be caused by certain rheumatic diseases, such as rheumatoid arthritis and systemic lupus erythematosus (lupus). These diseases cause swelling which can damage the knees permanently. Diagnostic tests (such as x rays, bone scan, CAT scan, MRI, arthroscopy, and biopsy). Chondromalacia occurs when the cartilage of the knee cap softens. This can be caused by injury, overuse, or muscle weakness, or if parts of the knee are out of alignment. Chondromalacia can develop if a blow to the knee cap tears off a piece of cartilage or a piece of cartilage containing a bone fragment. The meniscus is a C-shaped piece of cartilage that acts like a pad between the femur (thigh bone) and tibia (shin bone). It is easily injured if the knee is twisted while bearing weight. A partial or total tear may occur. If the tear is tiny, the meniscus stays connected to the front and back of the knee. If the tear is large, the meniscus may be left hanging by a thread of cartilage. The seriousness of the injury depends on the location and the size of the tear. Two commonly injured ligaments in the knee are the anterior cruciate ligament (ACL) and the posterior cruciate ligament (PCL). An injury to these ligaments is sometimes called a �sprain.� The ACL is most often stretched or torn (or both) by a sudden twisting motion. The PCL is usually injured by a direct impact, such as in an automobile accident or football tackle. The medial and lateral collateral ligaments are usually injured by a blow to the outer side of the knee. This can stretch and tear a ligament. These blows frequently occur in sports such as football or hockey. Surgery (for more severe injuries). Overusing a tendon (particularly in some sports). The tendon stretches like a worn-out rubber band and becomes inflamed. Trying to break a fall. 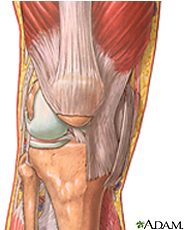 If thigh muscles contract, the tendon can tear. This is most likely to happen in older people with weak tendons. One type of tendinitis of the knee is called jumper’s knee. In sports that require jumping, such as basketball, the tendon can become inflamed or can tear. Osgood-Schlatter disease is caused by stress or tension on part of the growth area of the upper shin bone. It causes swelling in the knee and upper part of the shin bone. It can happen if a person’s tendon tears away from the bone, taking a piece of bone with it. Young people who run and jump while playing sports can have this type of injury. Iliotibial band syndrome occurs when a tendon rubs over the outer bone of the knee causing swelling. It happens if the knee is overused for a long time. This sometimes occurs in sports training. Limiting sports activity Exercise for stretching and strengthening A cast, if there is a partial tear Surgery for complete tears or very severe injuries. Surgery to remove the plicae if the first treatments do not fix the problem. Warm up before playing sports. Walking and stretching are good warm-up exercises. Stretching the muscles in the front and the back of the thighs is a good way to warm up the knees. Make the leg muscles strong by doing certain exercises (for example, walking up stairs, riding a stationary bicycle, or working out with weights). Avoid sudden changes in the intensity of exercise. Increase the force or duration of activity slowly. Wear shoes that fit and are in good condition. Maintain a healthy weight. Extra weight puts pressure on the knees. What Types of Exercise Are Best for Someone With Knee Problems? Range-of-motion exercises. These exercises help maintain or increase flexibility. They also help relieve stiffness in the knee. Strengthening exercises. These exercises help maintain or increase muscle strength. Strong muscles help support and protect joints with arthritis. Aerobic or endurance exercises. These exercises improve heart function and blood circulation. They also help control weight. Some studies show that aerobic exercise can reduce swelling in some joints.cochlear implants, special training, certain medicines and surgery. For Further Information Please Visit All Medical Diseases Website.